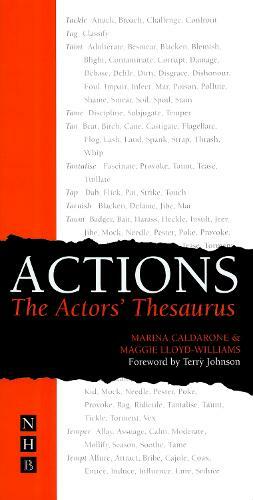 A vital companion for actors in rehearsal - a thesaurus of action-words to revitalise performance Actors need actions. They cannot 'act' adjectives, they need verbs: they need an aim to achieve, an action to perform. 'Actions' are active verbs. 'I tempt you.' 'You taunt me.' In order to perform an action truthfully and therefore convincingly, an actor needs to find exactly the right action to suit that particular situation and that particular line. That is where this book comes in...It is a thesaurus of active verbs, with which the actor can refine the action-word until s/he hits exactly the right one to help make the action come alive. It looks like this: taunt insult, tease, torment, provoke, ridicule, mock, poke, needle tempt influence, attract, entice, cajole, coax, seduce, lure, fascinate It is well known in the acting community that random lists of action-words circulate rehearsal rooms in dog-eared photocopies - as a sort of actor's crib. This book makes them available for the first time in an organised and comprehensive form.